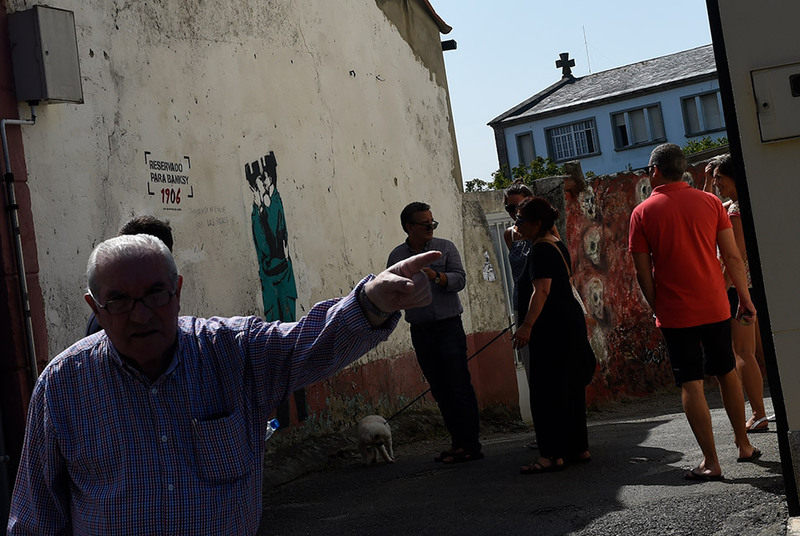 People look at a stencilled mural of two Guardia Civil officers locked in a kiss painted on a wall that was officially "reserved for Banksy" in Ferrol, on September 2, 2018, during the annual street art festival "Meninas de Canido" set up in 2008 to breathe new life int a dying neighborhood. In 2008, sick of seeing his derelict neighbourhood dying a slow death, Spanish artist Eduardo Hermida walked out of his studio one day and painted a mural inspired by Diego Velazquez's "Las Meninas" masterpiece. It was a spontaneous protest begging authorities to do something in Canido in the industrial, northwestern town of Ferrol, dubbed Spain's Detroit for its population drain and abandoned homes. MIGUEL RIOPA / AFP. MADRID (AFP).- It was too good to be true. A mural sporting Banksy's alleged signature in a declining town in northwestern Spain that had caused a sensation when it appeared overnight in April is not by the legendary street artist, his website said Friday. The cheeky, stencilled image of two Guardia Civil police kissing had appeared on a white wall that had been "reserved for Banksy" in Ferrol, where a street art festival set up in 2008 to breathe new life into a dying neighbourhood takes place every year. At the time, Spanish media was rife with speculation as to whether the image -- which strongly resembles one of the artist's most famous images portraying two British cops kissing -- was actually his. But as the annual festival kicked off on Friday, AFP sent an email to Banksy's official website banksy.co.uk asking whether it was indeed his. The response was: "It is not by Banksy." The story started in 2017 when Estrella Galicia, a beer brand that had just started sponsoring the festival, took out ads in several British cities and newspapers calling for Banksy to join in. The festival was created by Eduardo Hermida in 2008 who decided to get fellow artists to plaster walls and even doors in the district of Canido with their versions of Diego Velazquez's famed 17th century "Las Meninas" painting. The aim was to breathe new life into his beloved neighbourhood, in an industrial town dubbed Galicia's Detroit for its population decline and abandoned spaces. "Dear Banksy, we have reserved a space for you on one of our streets so that you can freely express your most personal interpretation of Las Meninas and help us to make our neighbourhood a more beautiful place to live," read Estrella Galicia's ad. That was in October 2017. Then in April appeared the mural in the style of the mysterious artist, generating huge excitement. As the months went on, doubts crept in that it was indeed Banksy's. Speaking to AFP on Friday, Hermida said he had also written to that same official website asking and that they had never denied it was Banksy's. He added he had even received an email coming from Banksy's website early this year asking him for the exact localisation of the white wall, on which the image appeared months later.